Walk, run and hike with confidence on snow and ice! Preferred by the U.S. Military and the U.S. Postal Service, Due North Oversize Ice Cleats (formerly Get-A-Grip Xtreme Shoe Cleats) increase traction and help to prevent slips and falls on snow and ice, reducing the risk of possible pulled muscles, fractures and back problems caused by a quick slip or fall. The Get-A-Grip eXtreme by DueNorth is specially designed for large feet (men's size 10 and larger) and oversized winter boots and footwear. It is ideal for those who play or work outdoors. 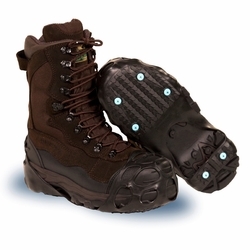 Get-A-Grip snow and ice cleats are manufactured by SureFoot Corporation under the Due North brand. Special compound rubber that retains elasticity in all temperatures won't stretch out! Specifically designed for oversized boots and winter footwear.